Jeremy Lawyer is headed into the FLW Series Championship with a ton of momentum coming off his win at the Lake of the Ozarks. Prior to last week, nearly a quarter of Jeremy Lawyer’s 39 top-10 finishes (nine) in FLW competition had come at Lake of the Ozarks in his native Missouri. Not one was a victory. 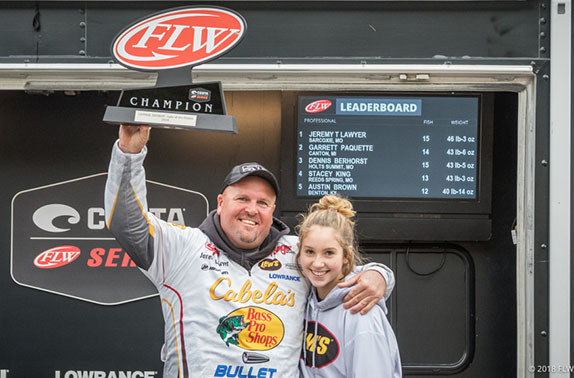 He finally cracked the code at the final Central Division FLW Series of the season, capping off a dynamite run in the division that saw him finish 2nd in points and lock up a berth in the FLW Series Championship at Lake Guntersville early next month. Lawyer triumphed with a three-day total of 46-03, relying on a combination of a shaky-head and a topwater amid transitional conditions at the massive, serpentine Osage River reservoir in central Missouri. He edged Garrett Paquette, who will compete in the Bassmaster Opens Championship this week at Table Rock Lake, by a little less than three pounds. While Lawyer calls Grand Lake in northeastern Oklahoma his home lake, Lake of the Ozarks is where he honed his tournament game and that added an extra layer of meaning to the win. “When you start looking at everybody in it and the local anglers with the reputations they have, it’s a great feeling,” he said. It’s understandable how those same anglers would hold Lawyer in the same regard had any of them prevailed. When Lawyer arrived for practice last Saturday, he said it felt like mid-summer. By the time the tournament rolled around, he had to layer clothing under his foul-weather gear. Fall had arrived. Lawyer’s ability to locate areas where early fall transition fish had pushed in toward the bank and around boat docks is what ultimately separated him from the pack, but a decision he made in practice also proved critical. He’d planned for five days of practice and got in a groove, but as the tournament drew closer and the weather started to change, he opted to skip the final day of practice. In practice, his most productive pattern was dragging a shaky-head. A topwater barely produced any bites. That all changed come tournament time. Lawyer’s day-1 weight of 14-07 consisted mainly of fish caught off boat docks with a Zoom Magnum Trick Worm. Just one of his five weigh-in fish came on topwater. With the weather taking a turn for the worse on Friday, his dock bite waned, but the topwater bite more than made up for it. His 18-00 was one of five 18-pound or bigger stringers on day 2 and it catapulted him into 4th entering the final day. The fog got bad enough that FLW sent a text message to competitors advising them they could weigh in early if they desired. Lawyer opted to stay out and ride the Whopper Plopper in the afternoon. His best fish came around midday as he bagged a 5-11 and another 5-pounder within 20 minutes to cull out a pair of 13 1/2-inch spotted bass. Still, he was able to stay on top of the early movers on the final day when fishing conditions toughened further. Once Saturday did roll around, he settled on a stretch of underwater riprap that had been reliable in the past. Four of those fish came on a Whopper Plopper, so he made sure to roll back through areas where he’d gotten blowups earlier in the week. By 10:30 a.m. he got the sense he’d exhausted the area he’d been in the first two days, so off he went 35 miles in the other direction. After making the move on the final day, he caught another five keepers and culled up a couple more pounds. He said another factor that hampered fishing Saturday was the increase in recreational traffic that is typical on weekends there. “It would’ve been a better Wednesday-Thursday-Friday tournament,” he said. > Shaky-head gear: 7’6” heavy-action Lew’s Custom Pro casting rod, Team Lew’s Lite Speed Spool LFS Series casting reel, 17-pound unnamed fluorocarbon line, 3/8-oz. Jakked Baits J-Law’s 413 Shaker HD jig head, Zoom Magnum Trick Worm (green-pumpkin). > Topwater gear: Same rod, same reel, 50-pound braided line, River2Sea Whopper Plopper 130 (midnight shad). > Lawyer had the Whopper Plopper painted a custom color by Fall Creek Lures. > He also caught keepers on a Freedom Tackle Co. swing-head buzzbait (black with gold blade) trimmed with a Zoom Horny Toad trailer. “The buzzbait was way better for numbers, but the larger ones came on the Plopper,” he said.